One important thing to remember is that a stock on the Pending Trades table doesn’t officially trigger until we see a daily close over the Trigger Price. Sometimes this might seem counter-intuitive since it’s common to associate the word “Trigger” with the exact price you want to buy a stock. But in this case the Trigger Price can actually be thought of as a Trade Barrier – meaning that the price level is an area that the stock needs to surmount in order to break-out and begin a new up-cycle. A perfect example of this is FNSR. FNSR spent several weeks on the Pending Trades list with a Trigger Price of 21.75 before it actually closed over that level. Notice on the chart below how it poked over 21.75 multiple times before it actually had a daily close over that level. Notice the day it “Triggered” on January 25th it actually gapped-up at the open and faded before rallying back up to close over the Trigger. As you know, we wait for a stock to have a daily close over the Trigger and then the next day it becomes an Open Trade – as long as the high of that day is over the Trigger Price. Once a stock triggers the Target and Trailing stop get calculated by the system. You’ll see those show up on the Triggered Today table. You can see on the chart how the initial tstop was just under the previous lows at 21.05 and this made it an unusually low-risk trade – compared to others you will see. 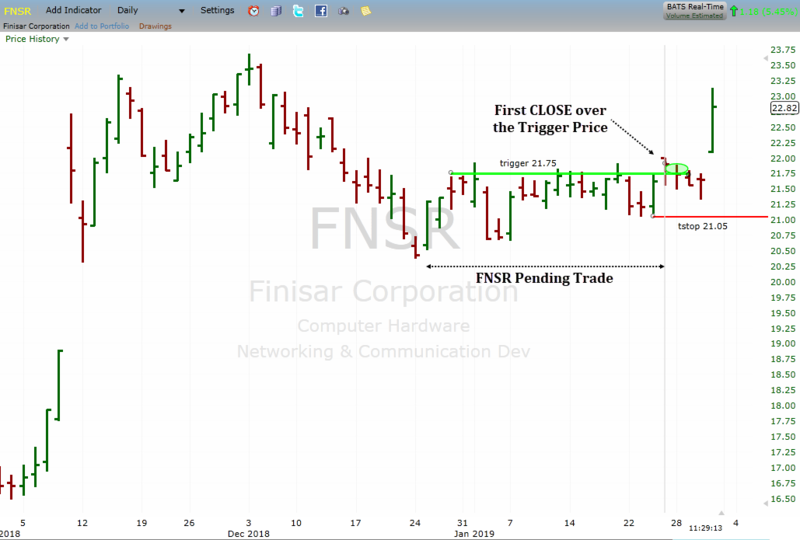 The nature of the sideways consolidation from late December to mid-January made FNSR an ideal candidate for a breakout – providing the stock could get over the Trigger (barrier). Even though it struggled for a couple days after initially triggering, it broke out with a nice long-range bar today. The main takeaway here is to wait for confirmation – a CLOSE over the Trigger Price – as it’s designed to be the confirmation we look for that a stock is showing enough strength to the upside that it can go on to get some follow-through to the upside.